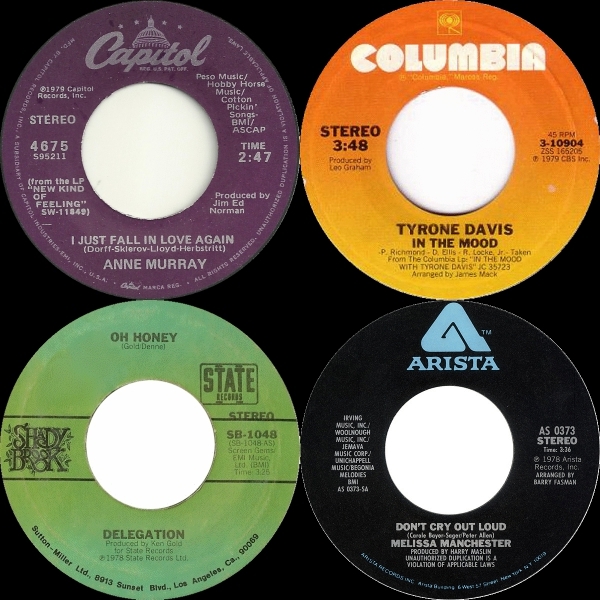 At first, second and third glance, the WLS Forty-fives list dated April 28, 1979, is conspicuously heavy with thumping disco beats and is even bookended by disco tracks at numbers 45 and 1. 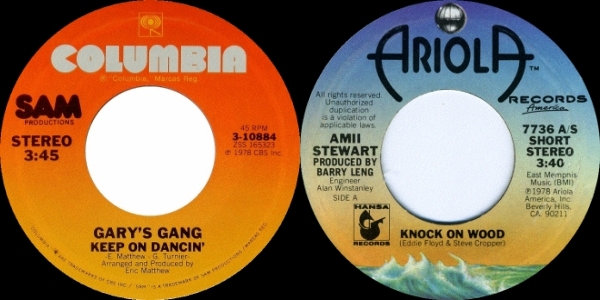 Debuting at number 45 is Gary's Gang's "Keep On Dancin'" and moving up from number 4 to Number One is Amii Stewart's disco remake of Eddie Floyd's "Knock On Wood". Our junior high cheering squad had a really good routine to the latter as well as another performance set to Sequence's "Funk You Up." 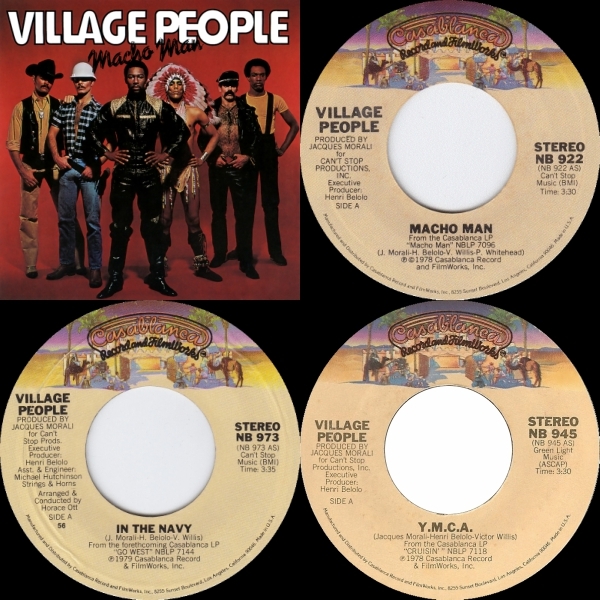 Four disco acts have multiple singles on the countdown, with the Village People besting both the Bee Gees and CHIC with three tracks to their two each. 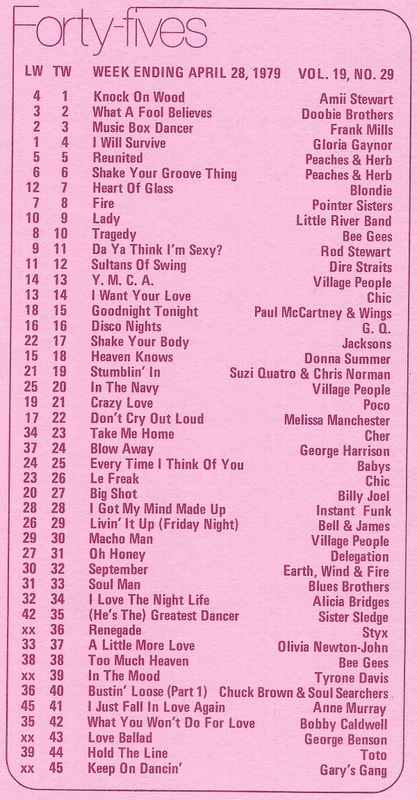 "Macho Man" at number 30, "In The Navy" rising five to number 20 and up one to lucky number 13 is "Y.M.C.A." The group was is also the only act with two albums on the week's Thirty-threes chart, with Go West moving up at number 32 and Cruisin' slippin' down at number 17. 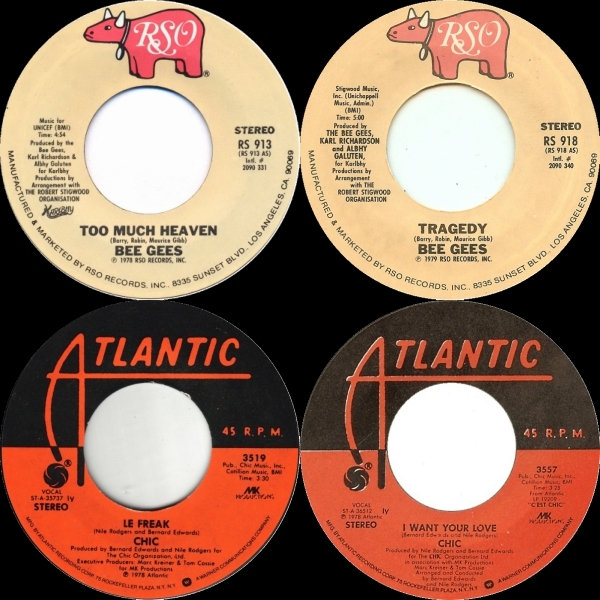 The Brothers Gibb held at number 38 with "Too Much Heaven" and slipped two to number 10 with "Tragedy", both of which were my favorite songs for a while. CHIC fell three spots to number 26 with "Freak Out" "Le Freak" and "I Want Your Love" got bumped down by "Y.M.C.A." and landed at number 14. 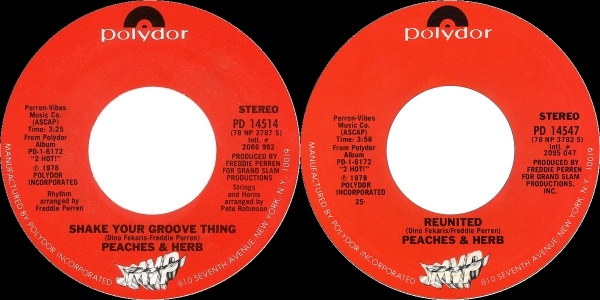 Peaches & Herb is the fourth act with more than one single on the Forty-fives chart but what makes their accomplishment stand out just a little more is they are back to back on the list with "Shake Your Groove Thing" holding at number 6 and "Reunited" holding right above it at number 5. In addition to these two singles, Freddie Perren produced the number 4 single, Gloria Gaynor's "I Will Survive" giving him three songs on the chart right next to each other. 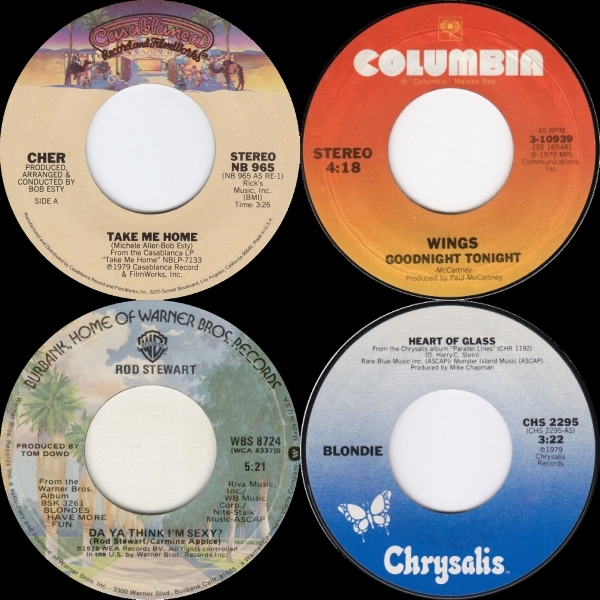 Cher moved up eleven spots to number 23 with "Take Me Home"
Wings crept up three places to land at number 15 with "Goodnight Tonight"
And Blondie jumped five other songs to make it to number 7 with "Heart of Glass". The only track I could not recall simply by looking at the list was Delegation's "Oh Honey" at number 31. Now that I've looked it up and listened, I need never hear it again. Same goes for numbers 41, 39 and 22, all pictured above. 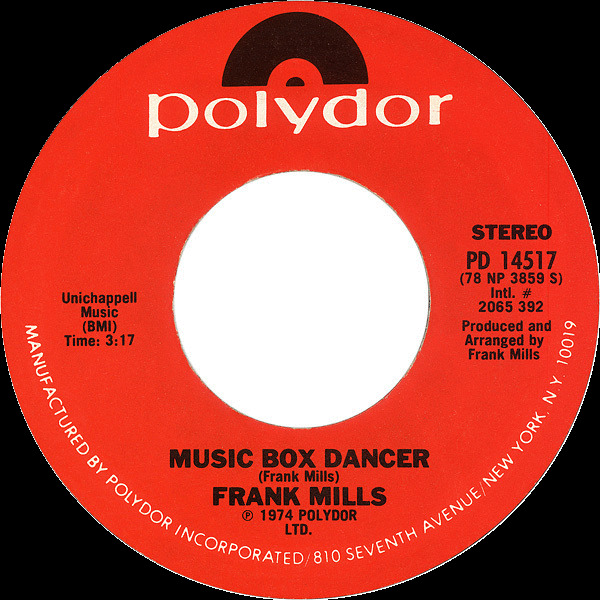 The head-scratcher on the list is Frank Mills and his "Music Box Dancer" at number 3 after peaking at number 2 the week before. I like the song for reasons I can't quite put my finger on. The sheer prettiness of the melody was the selling point as the song was not featured in the Olympics or on a television soap opera or even in a catchy commercial. 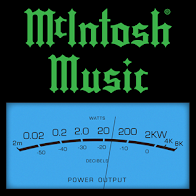 We just heard it on the radio during disco's peak and loved it.